BRANDON, Man. – The Pro Series premiere of the Manitoba Trombone Collective will take place on Tuesday, Feb. 28 at Brandon University’s (BU’s) Lorne Watson Recital Hall. Comprised of top-notch trombonists, the group will present a programme of chamber music in a range of styles and genres. 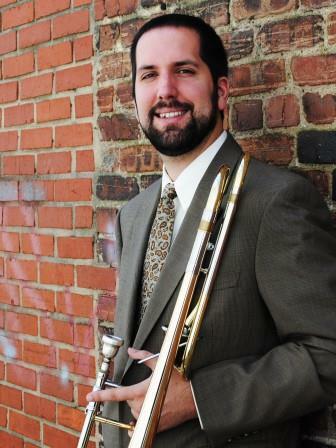 Brandon University faculty member Dr. Aaron Wilson will be one of the performers in the Tuesday, Feb. 28 Pro Series concert by the Manitoba Trombone Collective. The Collective is a fluid entity, with trombonists from throughout the province often gathering to rehearse and perform in Winnipeg for various occasions, and six of them will represent the group for this event. Along with Dr. Wilson, the other musicians lined up will be Keith Dydra, Steven Dyer, François Godère, Julia McIntyre and the ensemble’s director, Joel Green. The idea to leave Winnipeg and venture further afield was born from a gathering of more than 60 trombonists to premiere a composition by Winnipeg-based composer Kenley Kristofferson. Inspired by that exhilarating event, the trombonists planned this concert at BU and another at the University of North Dakota next month. The Collective is now considering similar collaborative performances for a greater number of trombonists to perform music created or arranged for their instrument. “When I proposed this idea, it was suggested we try to keep the group somewhat small,” said Dr. Wilson. “Chris Lalonde, the manager and founder of the Manitoba Trombone Collective, proposed the idea of putting together a chamber concert filled with some of Manitoba’s finest trombonists. Tuesday’s concert will begin at 8 p.m., at the Lorne Watson Recital Hall, located in the Queen Elizabeth II Music Building at BU. Tickets will be available at the door prior to the performance or in advance at the School of Music main office. They are $15 for adults, $12 for seniors, students and BU alumni, and $10 for Conservatory students. The next Pro Series presentation will be the Brandon University New Music Festival, featuring three evening performances from March 26 to 28 at the Lorne Watson Recital Hall. The soloists will be pianist Megumi Masaki, electric guitarist Tim Brady, and violinist/violist Pamela Attariwala, this year’s Stanley Knowles Distinguished Visiting Professor at BU. Please note that seating in the Lorne Watson Recital Hall is limited and that programmes are subject to change. For an up-to-date listing of Pro Series and student performances, please visit brandonu.ca/music/events/category/performances.